The connections with people that last a lifetime through online and tabletop games and a shared passion for exploring machines and their languages are the soul of the machines. Multi-user chat, Crossroads of the Elements MUD, Elite-x/84, Exodus GameNet, Tabletop RPGs, Programming, Microcomputers. Connect to Anima Ex Machina Now! 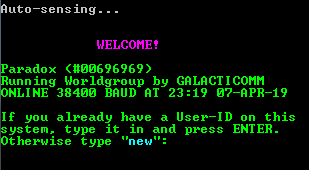 This BBS is using a non-standard telnet port (6023), the web telnet script may not work. Telnet on port 6023 is also open, but not recommended since telnet exposes your password in plaintext to anyone on any machine carrying the packets between us.